2014 Score Football is something of a retail take on 2014 Panini Hot Rookies. Although a different product, it shares many of the same designs and inserts. But rather than being loaded in the hits department, 2014 Score Football is more about base cards and inserts. But that's not to say the product doesn't have any autographs and memorabilia cards. Every 24-pack box is supposed to have one. 2014 Score Football has a lot of basic inserts. These combine to fall 16 per box. Brothers in Arms (1:8 packs) spotlights teammates. A Gold parallel lands one per box. 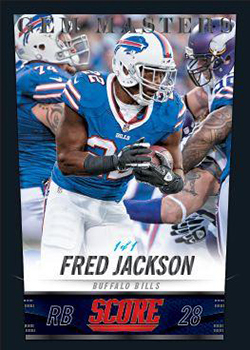 Franchise, a longtime Score staple that features the league's best players, returns at a rate of two per box. Air Mail (1:24 packs) has a die-cut design along the bottom of the card. Other inserts include Behind the Numbers (1:24 packs), Complete Players (1:12 packs), Destination End Zone (1:24 packs), Field Commanders (1:24 packs) and Numbers Game (1:6 packs). Retail Hot Rookies cards bring the first-year players fresh from the NFL Draft. These are inserted 1:4 packs. 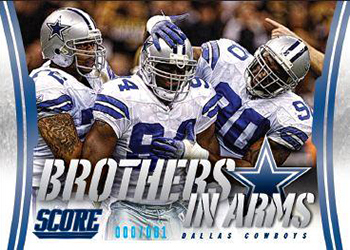 2014 Score Football has several parallels. Many of the names have been used in the past, but there's a greater focus on using colors to make them more distinct. Parallels include Scorecard (1:12 packs), Showcase (#/99), Gold Zone (#/50), Artist Proof (#/35), Red Zone (#/20), End Zone (#/6) and Gem Masters (1/1). View a complete guide here. 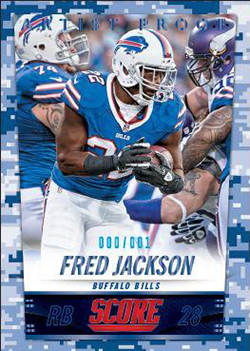 These were exclusive to packs given away at the 2014 NFL Draft. Each pack includes five random cards from 2013 products and one Score Rookie promo. Awesome product! From someone who is a big set builder I always look forward to the release of Topps and Score each year. I was really impressed with the changes Panini made to the “Zone” cards (Red,Gold,End) this year. In years past its been a simple stripe that said “Gold Zone” or whatever. This year,the entire card front is foil board of that color. The Ray Rice gold zone I got was amazing looking. Only thing driving me crazy is the “Hot 100” cards. Not a parallel set due to the card numbers and photos being different than the base set. Guessing its a sub-set of some kind. Anyway,it will be fun to collect that set as well. I have seen some commenting about not getting auto or mem. Funny,I bought 6 boxes and all delivered as promised. I got 4 autos and 2 mem out of my 6. Don’t believe the review, every 24 pack box does NOT have an auto or memorabilia card. Mine had none… but I did get a Michael Same Red Zone rookie /20. 1 blaster and a hanger pack produced several inserts with a gauranteed hit, which was a jersey card. I pulled a E.J. Manuel. Like any entry level product, don’t expect Panini Momentum type quality. Unlike last years product in which past Score designs were utilized, this years set is very refreshing and fun. For complete set collectors, this years design will be very attractive. More importantly are the various inserts available. “Behind the Numbers” foil design is done tastefully. 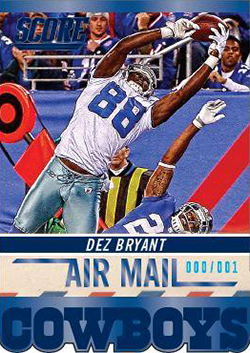 My favorite second to only the jersey card is the Score standard “Airmail”. The bottom of the card has a very nice die cut that separates it from the rest of the inserts. With a huge veteran set, and a deep rookie class this years Score will be very popular with collectors no matter what genre your into. We’re with you. We’ve requested the final checklist but have yet to hear back. We will post it as soon as we get it. Jeez, just pulled a scorecard Hot 100 which apparently there are 166 of, sub sets upon subsets, this master will be incredibly difficult but affordable at the same time. Good stuff. “Every box is supposed to have one (hit).” Ha! I’ve seen a majority without a hit. A Panini customer service rep said they had an issue with the hits. Really? Ugly cards, failure to provide the content promised…one star is generous. Missing Hits, No checklist, Poor collation… Swing and a miss Panini. Way to bring in the new product season with a dud instead of a bang. Can someone tell me how I just opened a pack of these score 2014 football cards and found a thick white piece of card!? LionsFan � Those are often referred to as decoys to deter pack searching. The thought is that they’re thick like a memorabilia card so that the packs actually with jerseys and the like blend in a little better. Thanks Ryan – was worried it was some kind of place holder that wasn’t “replaced” – I’m a new collector and didn’t know this happened. I’ve had a much better experience with the smaller blasters that gaurentee a Jersey or Helmet. Never missed a hit, and out of 5 I’ve pulled some pretty cool stuff. First 3 I bought had Sammy Watkins Helmet RC, Nick Foles Jrsy, Another RC helmet along with a Gronk hot 100 Gold /50. The 2 I bought the other day were more interesting. First one had the Morris Claiborne FFF jrsy card, and then when I opened the second I saw the FFF jrsy Claiborne from the back. I was miffed at getting doubled up like that until I flipped it over, and the second was a sick patch /25. Second box also had a Geno Smith AP /35. Stick with blasters, huge print run, gotta get lucky. I haven’t seen another gold patch of ANYONE from score except for a backfield Tandems dual. Huge print run, retail only, can’t expect hits. My twin boys (7) and I bought a box today. No auto’s, no patch cards. We did get a bunch of inserts, but they were bummed on the lack of an auto or patch. Also bummed we had to talk down the price from the local card store who sold it online for $8 less than in the store. But we like the look of the cards and the inserts. Just wish they mixed up the order some. I’m a big fan of getting your moneys worth, and the box offers a LOT of cards, especially rookie cards. I collect autographs, but I send the cards to players directly to get signed, so I’m not too mad about not getting autographs in the box. Would be cool though, haha. I enjoy the $5 packs that get you 52 cards. You nearly double the amount of cards you get for the same price as one box. I also enjoy the design and some inserts I do have (JJ Watt #/32, some rookies #/50). 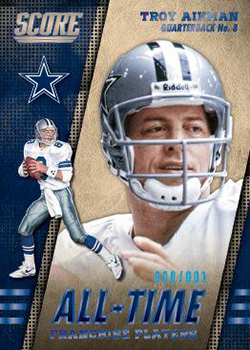 I just don’t like the “throwback rookie cards” There’s honestly no point in them. Completely Worthless. Otherwise, it’s a good value if you’re a card collector, just a little bit harder to get super rare/collectible cards. is really worth the money. I have to say that I have really enjoyed buying the $5 dual packs that get you 52 cards, you nearly double the amount of cards you get for a box, also I recently scored big when After I decided to buy my first retail box, I scored a big hit when I got several parallel cards, out of all the cards I got there was a BARKEVIOUS MINGO Future Franchise Jersey Browns #FFF-BM dark jersey card. I also just recently picked up 3 double packs and got a Xavier Rhodes #125 RED ZONE #02/20 red foil Minnesota Vikings card, so I am pretty much a happy camper with these football cards. The Panini Group did an awesome job with these cards. Just started collecting. Good price and you get lots of cards. Bit upset about one of the blaster boxes I purchased which had doubles of the rookie cards in about 6 of the packs. Otherwise I’ve gotten one autograph and 2 jersey cards in 3 blasters which is good. I think for the cost Score is the way to go. Great pictures, the backs have nice info and are easy to read, and they’re cheap. They’re fun to get and the inserts are cool. 2014 Score Football Hobby Box - Factory Sealed!